Many girls have for a long time using the services of specialists, increasing the nails of various shapes and lengths. Correctly modelled artificial tips transform the structure of the natural nail plate, visually hiding the possible disadvantages. Despite the fact that the natural contours are most popular, master nail art continues to amaze their clients, offering them more extravagant and interesting shapes. 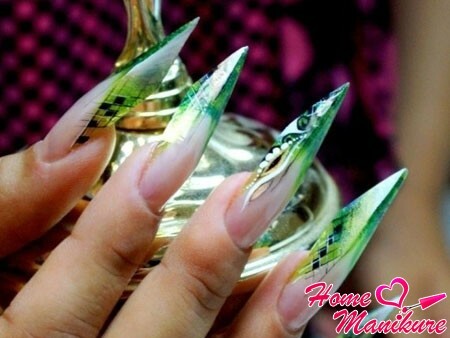 Such original nails as “Stiletto”, “Pipe”, “Age” or “Almond” like many girls. 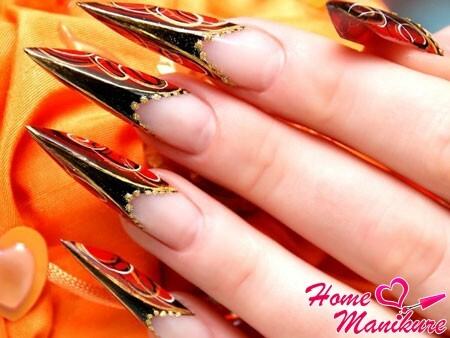 But today we will tell you that is a extraordinary form of nails “Bridget” which differs harmony of classic and extravagant shapes. Form of “Bridget”, developed by Alexander Fin’ko, characterized by the presence of two faces, three planes and a tapered tip. This is perhaps the most complicated in execution form the nail plate, which modelling should trust only the high-end professionals. 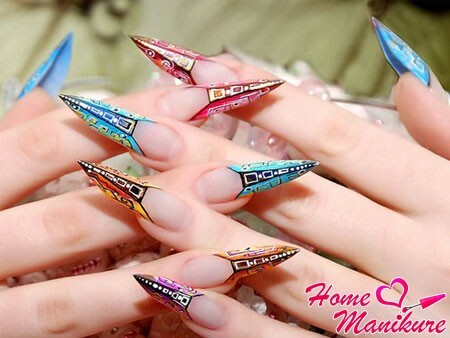 Master, fluent in standard technology capacity, knows the characteristics of each form of artificial nails and be able to recreate the perfect features. Elegant marigold “Bridget” – a fine piece of work, which requires compliance with the basic rules and geometric accuracy. Deciding to become an owner of beautiful nails in the style of “Bridget”, responsible approach to the selection of the cabin as to create unique contours can be done only by qualified personnel. So difficult in execution form is impeccable, if the master build correctly perform all the steps, taking into account some of the subtleties. Significantly affect the outcome correct formulation and fixing the paper template to build nails using acrylic or gel. Primarily, it is necessary to bend the pattern, creating the two faces which converge towards the edge of the nail. When installing the paper form must make sure that the edges of artificial claw located at the same angle relative to the longitudinal arch. manicure main rule in the style of “Bridget” – observation of symmetry and fine lines . After building the master shifts to the filing of the nails, giving them the necessary features. Please cut sides of the nail plate, and then – the tip. After that, the trimming of the side edges and the upper edge. As a result of hard work nail should take the form of pronounced triangle. The unusual shape of the nails was created in order to captivate the female looks to the handles, so the “Bridget” – selection of confidence in their own irresistibility girls. The original structure of the nail plate is self-sufficient and interesting, because its surface is composed of three seamlessly flowing into each other planes. Emphasize these modulations can be even with monochromatic coating that will sparkle with new reflections on these marigolds. Strengthen bewitching effect material with small pearl or glitter. So extravagant form does not need to throw design. However, for special celebrations can be decorated with elegant decorative painting nails with a minimum of decoration. Small composition three-plane surface to decorate and emphasize the beauty of extravagant forms, not distract attention from it. You can estimate what the most successful patterns appear on the original nails “Bridget” by viewing a small collection of photos. If you enjoy being in the spotlight, the nails in the style of “Bridget” – the perfect way to accentuate your exclusivity and originality. The round shape of the nails.